Image: Evelyn Hockstein/For The Washington Post via Getty Images. 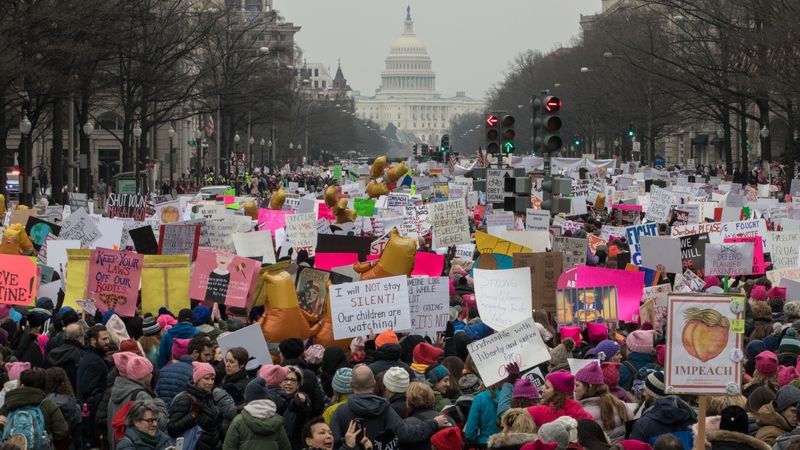 Marchers gathered across the globe on Saturday for the third annual Women’s March, and despite several obstacles, the turnout proved to be impressive and the message powerful. Due to the government shutdown, the original plans to gather at the National Mall had to be altered (the National Park Service would not be able to plow in the event of snow), so the start was ultimately rerouted to Freedom Plaza. Harsh winter weather from Canada down into New England and even into the Midwest meant dealing with frigid temps, ice and snow. Hundreds of thousands of women and men in more than 300 cities across America and many foreign cities persisted to encourage camaraderie, to fight for equality and to underscore the importance of inclusion across gender, race and religious lines. Here are some of the most inspiring images and video from the 2019 Women’s March. With @uclawsoccer at the #Womensmarch in LA. Women are 16x more likely to be killed with a gun in the US than in other developed countries. Gun violence is a women’s issue. Inspiring to hear @AyannaPressley talk about using our righteous indignation to deconstruct systems of oppression by fighting for equity in housing, health care, education, and wages. Jewish women of color led the DC #WomensMarch2019, powerfully showing up as their full selves. Being seen and celebrated as their full selves. We’ve ushered in a new era on the left, a new kind of women’s and racial justice movement. Because of #JWOCmarching.